Tourists mainly associate Karelia in northwest Russia with its many lakes, wooden architecture, romantic walks, boat excursions and the enigmatic traces of prehistoric man. RBTH invites its readers to also consider this region’s unique cuisine. Karelia is a borderland that brings together the traditions of different peoples, and each ethnic group – Karelians, Vepsians, Finns and Russians – have made their own contribution to the local gastronomic culture. However, Karelian cuisine also shares features typical of the Russian North: Nourishing pastries, fish, venison, elk meat, game, wild fruits and mushrooms. In general Karelian food is not fried, but rather baked or stewed in saucepans or earthenware pots with little seasoning. We’ve created a menu for a filling Karelian lunch and compiled a list of eateries in Petrozavodsk, the capital of Karelia, that are fit for hungry travelers. 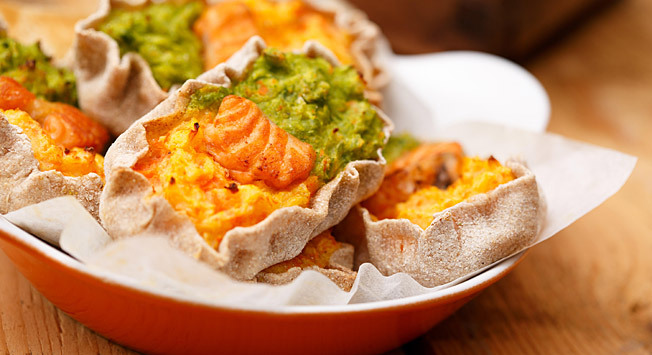 The Russian North, and Karelia in particular, is famous for its baked dishes. “Kalitka” is not a dish that every Russian has tried. It is a small open pie made of rye flour dough with a filling made of millet kasha or potatoes: it’s one of the most popular snacks in Russian and Finnish Karelia. Rice, tvorog (similar to unsalted cottage cheese), and even fish and meat are sometimes used as a filling for kalitki. In addition to kalitki, other northern pies popular here include the Finnish bread “rieska,” fish pastries and “svatelny pirog” (a pie made with a unique batter). As a snack, salted and marinated Karelian mushrooms are very popular: White mushrooms, milk mushrooms and the rare but valuable red pine mushrooms are a universally recognized as a delicatessen here. On the menu of many Karelian restaurants you’ll find the words “kalakeinitto,” “lohikeitto” and “maimarokka.” They’re all Karelian fish soups. Kalakeinitto is usually prepared with pike-perch, while the main ingredient of the broth is milk. Lohikeitto is another option for those who are not calorie conscious: This soup is made with fatty salmon and cream. Maimarokka is a soup of thin dry fish with onions and potatoes. In Karelia many other meat and mushroom-based soups are also popular. Karelia’s biggest lake – the Onega – contains such species of fish as the lavaret, sterlet, lake salmon, trout and brook trout. Empress Catherine the Great liked lavaret meat more than any other fish, which is why it is considered a “royal” fish to this day. We recommend trying a traditional baked lavaret, or a lavaret baked in rye dough. Meat-eaters will find dishes made of game, venison and elk meat, while those that lean towards the exotic and have deep pockets might consider trying bear meat. Good Karelian restaurants offer worthy alternatives for vegetarians: Different kinds of kasha, vegetable and mushroom dishes heated in earthenware pots do not play second fiddle to meat and fish offerings and are just as nutritious. The mousse of wild berries with oat flour has been known as a healthy dessert throughout Russia since ancient times. Karelian wild berries are often used in all kinds of sweet northern pies and pancakes. If your lunch has been so filling that you have no room for dessert, don’t despair: Try one of the sweet Karelian liqueurs made of cloudberries, cranberries, red bilberries or blueberries. This balm is a strong 40-degree alcohol drink made mainly of Marcial mineral water and more than 30 infusions of curative plants and berries, including cranberries, red bilberries, St. John’s wort, wild hedge rose, clover, oregano and fir needles. Karelian balm is drunk after having been cooled down either before or after eating. It’s also added to tea or coffee and can be used in cocktails by adding orange or cherry juice. The Karelskaya Gornitsa restaurant is perhaps the best restaurant in Petrozavodsk to take in some local atmosphere. The Finnish chef Tarmo Vasenius pays special attention to the way he prepares his dishes and uses a special, slow-burning oven to achieve unique flavors. It is worthwhile to try traditional as well as exotic kalitki (with salmon, elk meat or bear meat), Finnish soups, baked lavaret, fried vendace (a freshwater whitefish), “nalivki” a mild and sweet berry liqueur and home-brewed Karelian balm. The average bill is 1,500 rubles (about $25). Come to Cafe Kivach to meet local musicians and artists, and watch them perform in the evenings. The menu includes the Finnish soup lohikeitto and a homemade dish called “myaso po tayozhnomu” (taiga beef): Baked beef with potatoes, tomatoes, cranberries and cheese served in a hot pan. The average bill is 500 rubles (about $8). A menu in English can be found here. For an inexpensive meal, check out the lunch specials at the colorful “70-e gody” (1970s) café or the Aquareli café. A full lunch costs no more than 300 rubles (about $5) and the menu always includes traditional kalitki.